Ever since we moved to Australia, I've found it very difficult to get my hands on ladyfingers (also called okra). Its only in the last couple of weeks, I've found it at not just one, but two locations. This makes me very happy. We cook okra in a number of ways - in a prawn curry, pan fried in a spicy red rechaad masala, tawa style, and from now on I'm happy to report that as a once in a while treat I will use this recipe for a fantastic crispy version. 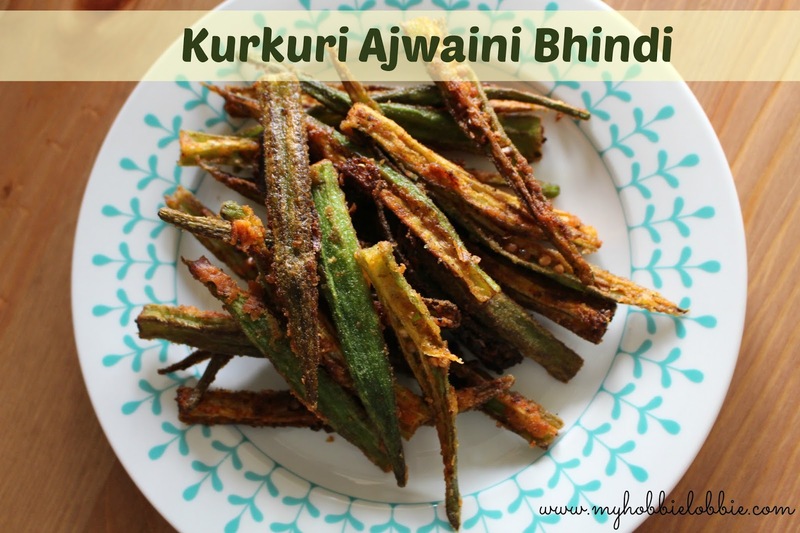 It is an extremely delicious recipe, albeit not the healthiest one and I would recommend not making this way too often as it starts off with deep frying the okra. The resulting okra is super crisp and makes a wonderful accompaniment to some dal tadka or khichdi or just by itself. My husband got through half the quantity I made even before we sat down for lunch. I'll take that as a win. I love this recipe not just because of the crispiness, but I happen to love the flavour combination of chaat masala with the carom seeds. So I hope you try it out too and enjoy it as much as we do. Wash and pat the okra dry. Cut the head off and discard. Cut the okra into quarters lengthwise. 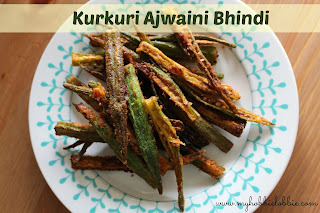 Sprinkle the ajwain, turmeric powder, chaat masala, salt and the besan on the okra. Squeeze the lemon juice and toss it well to coat the okra evenly. Add half the okra to the hot oil carefully and fry on medium heat till crisp. Drain on some absorbent kitchen paper. Repeat with the remaining okra. **Note: Mix all the ingredients just before frying. Do NOT do this in advance as the salt with just draw out the liquids and result in a soggy batch, which you don't want. Sounds delicious! I love okra, and this spicy and crispy version sounds perfect!